The Sales Boss reveals the secrets to great sales management, and provides direct examples of how you can start being that manager today. The not-so-secret "secret" is that a winning sales team is made up of high performers—but many fail to realize that high performance must be collective. A single star cannot carry the entire team, and it's the sales manager's responsibility to build a team with the right balance of skills, strengths, and weaknesses. This book shows you how to find the exact people you need, bring them together, and empower them to achieve more than they ever thought possible. You'll learn what drives high performance, and how to avoid the things that disrupt it. You'll discover the missing pieces in your existing training, and learn how to invest in your team to win. You'll come away with more than a better understanding of great sales management—you'll have a concrete plan and an actionable list of steps to take starting right now. Your people are the drivers, but you're the operator. As a sales manager, it's up to you to give your team the skills and tools they need to achieve their potential and beyond. This book shows you how, and provides expert guidance for making it happen. Without sales, business doesn't happen. No mortgages paid, no college funds built, no retirement saved for, until the sales team brings in the revenue. If the sales team wins, the organization wins. 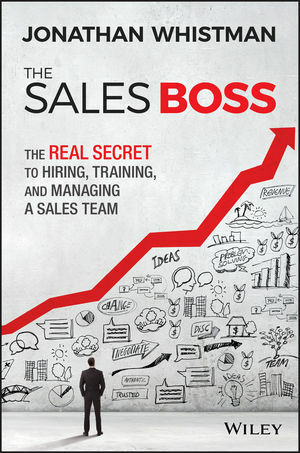 Build your winning team with The Sales Boss, the real-world guide to great sales management. JONATHAN WHISTMAN is a partner at the consulting firm Elevate Human Potential (www.elevatehp.com). He has trained, hired, managed, observed, and coached thousands of salespeople through his work with leading sales organizations. His work is centered on the belief that the greatest business results come from focusing on elevating the human potential within a business.